Beginning in 2014, at the 33rd Annual BRANA Campout, we recorded our four Main Speakers. We have continued this tradition going forward and are happy to post our speakers from the 37th Campout here on our site. As a free service to the NA Community we are providing MP3 recordings for playback on this site along with the ability to download a copy of each recording. Just right click (long press for mobile) on the speaker name to download and save. You can play them directly from the site by selecting the speaker and clicking on the the play button. To access recordings from previous events, go to the “Speakers” drop-down tab on the menu bar at the top of the site Homepage. We would like to extend our appreciation to all of the speakers for sharing their experience, strength and hope. The 37th Annual BRANA Campout opens today. Registration will be open at noon in the Natural Chimneys Visitors Center. A Narcotics Anonymous Participation meeting is scheduled for 12 noon in Shelter 3. Below is the event schedule for the 37th Annual BRANA Campout– Giving It Away!. You will receive a copy of the Event Schedule along with a campground map, campground rules and wrist band when you check in at the Registration Building. We are looking forward to another great event. See you there! 12 noon – We must be out of our sites (at least making an effort) unless registered through Natural Chimneys Staff for extended Camping. Online Registration for the 37th Annual Campout will close at midnight on Friday, July 13, 2018. If you need to cancel for any reason, your cancellation must be received by 12 am on July 13th, 2018 in order to receive a refund. Please see our cancellation/refund policy here. NOTE: We will be accepting credit cards for on-site registration as well as merchandise sales. For those planning to register at the event – there will be plenty of room for all! Final reminder! 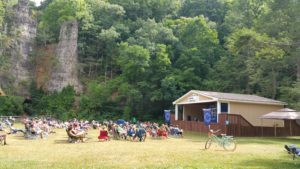 Campsites are still available for the 37th Annual BRANA Campout – Giving It Away. Online registration will be closing at midnight on July 13th. WE still have some Speaker slots open for BRANA 37. If you would like to speak and carry the message of Narcotics Anonymous, please contact us soon (see below). The BRANA Campout Planning Committee will meet at 11 am on Saturday June 2, 2018 at 441 Ohio Avenue, Harrisonburg, VA to continue the planning for the 37th Annual BRANA Campout. The BRANA Campout Planning Committee will meet at 11 am on Saturday, April 28th, 2018 at 441 Ohio Avenue, Harrisonburg, VA to continue the planning for the 37th Annual BRANA Campout.